There was not that much going on here lately. Wolfram and I are very busy these days, but we didn’t forgot about the blog. There are many ideas for articles but to few spare time to write them. Fortunately this will become a little bit better in a few weeks. 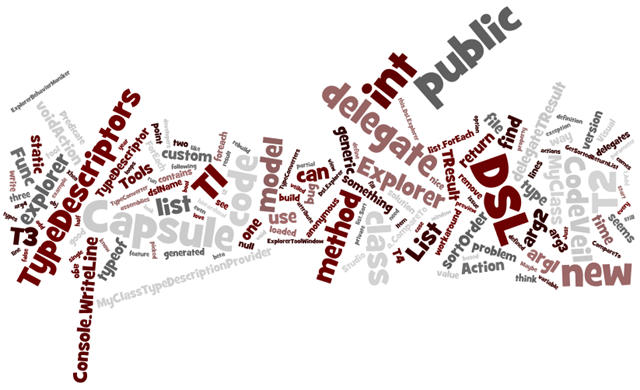 Produced with Wordle. 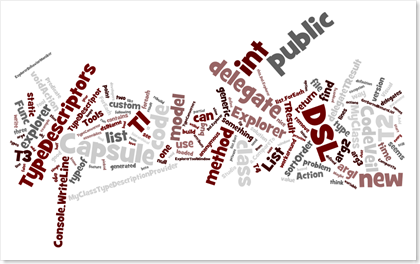 Images of Wordles are licensed . Aged 33, I am living in the beautilful city of Düsseldorf (near Cologne) with my wonderful girl Grace. Thanks to my father I started programming 25years ago and couldn’t stop. In school I liked mathematics and languages, which was a strange but unique combination. Consequently (meaning ‘through wild twists in my personal life’ ) I became a student of linguistics and quickly came to the field of computational linguistics. I graduated and after some more turbulences I started working for a nice company in Cologne. That’s where I first met Benjamin: The company was working on “java to .NET”-thing, Ben had already done the difficult tasks and I should type in some simple wrappings. I had learned C# like a week ago and felt dump like sh*t.
But I had time to improve and two year later we did the coolest project my working life so far: A converter from C#-Code to a special kind of process diagrams. I still like that tool a lot and realising it involved some of my major fields of interest like building parsers and pushing around graphs. Since mid of 2006 I am a freelancer and currently I am working for a big German retail and logistics company. I am interested in almost any subjects related to computers, except networking stuff :-). I am attracted most to games (boardgames as well, especially chess) and gaming theory, parsing, solving problems using graphs and .NET (of course). My personal main task for 2008 is to lose some significant amounts of weight. I am not a fat guy, but during the last couple of years I gained the typical IT-belly. I’ll come up soon with a nifty little post about comparing numbers. Stay tuned! I started this blog in November 2006 as a secondary blog besides my private Livejournal and didn’t know where it was going. I posted a few random links and news stories from the web and later some technical articles. In the past year I posted more and more (but not on a regular basis) technical articles. Technical article means something I discovered or learned while working with computers, windows, programming and thing like that. Now I will turn this blog in a real tech blog. First we changed the name: now this blog is called “Ticklish Techs – a mostly .NET but also some other cool techs blog�? and the name is pretty much a vague description of the upcoming content. Every time I have something to say about computers, software, programming (especially .NET) I will blog it here. And I will try to do this on a regular basis. The second news: I have to introduce my new co writer: Wolfram. He’s a colleague and friend of mine from Düssledorf, Germany. We used to work together for different clients and still work on our private projects together. From my point of view he is one of the top 20 percent programmers I know. The first time he appeared here in September last year on an article regarding the Win32 shell. He will start to write more articles worth reading here soon. I think 2008 will be interesting for us and this blog. Let’s see what’s coming. As a small outlook I will write some more articles on GPS and NMEA the next days and when I begin to work on my diploma thesis the next month I will certainly write some articles about Visual Studio 2008 (Orcas) Extensibility (VSX) and the DSL tools.